But in my other life roles, I also review and process documents all the time. That might mean different kinds of documents, depending on my role. As a mom, I might need to process papers from the kids' folders, including reenrollment forms, graded papers, and permission slips. As an adult, my husband and I have to review and track incoming tax forms. As a teacher, there are lessons to plan based on the parts of the Constitution. Each time I process documents, I have a simple code of Xs and Os that indicate where I am in the processing process. (See the red square below). In the example above, I was reviewing the Constitution, page by page, to create lesson plans. Once the plans for Page 1 were complete, the O (task to be done) became an XO. 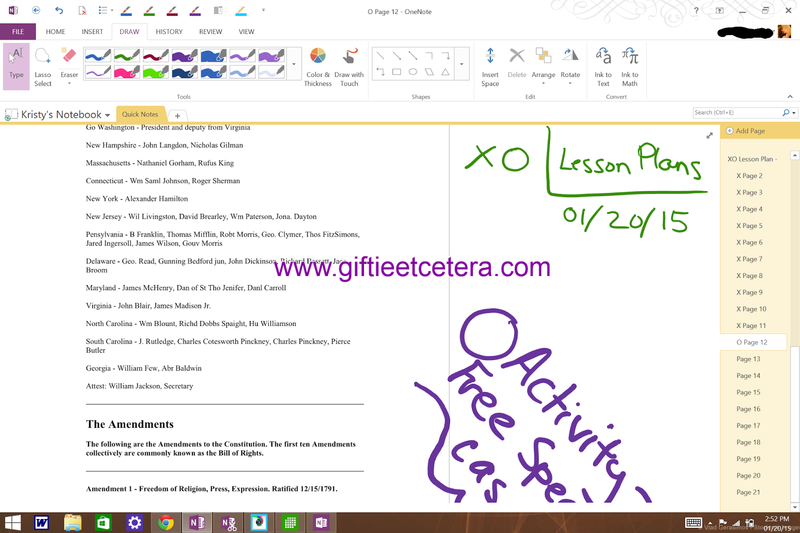 I read a bunch of pages that won't produce lesson plans (marked X), and I put a task on the page shown (marked O). The rest of the Constitution hasn't been reviewed yet, so it has no mark. 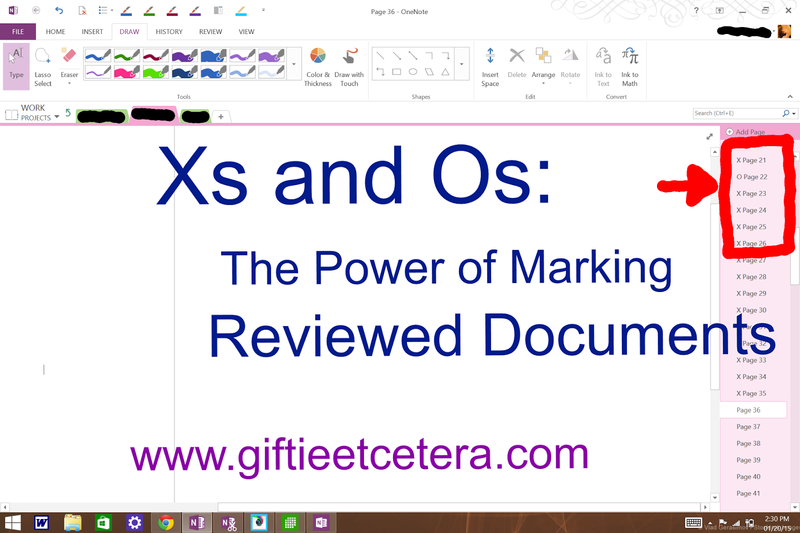 If I was reviewing paper documents (as opposed to on-line documents), I would write the O, X, or XO next to The Box that I use to indicate where to file the document. It's a simple code that makes sense. People routinely X out unimportant things and use a circle or square to mark a task, so this system is easy to use and remember. Forgive me but it looks like a football playboard! 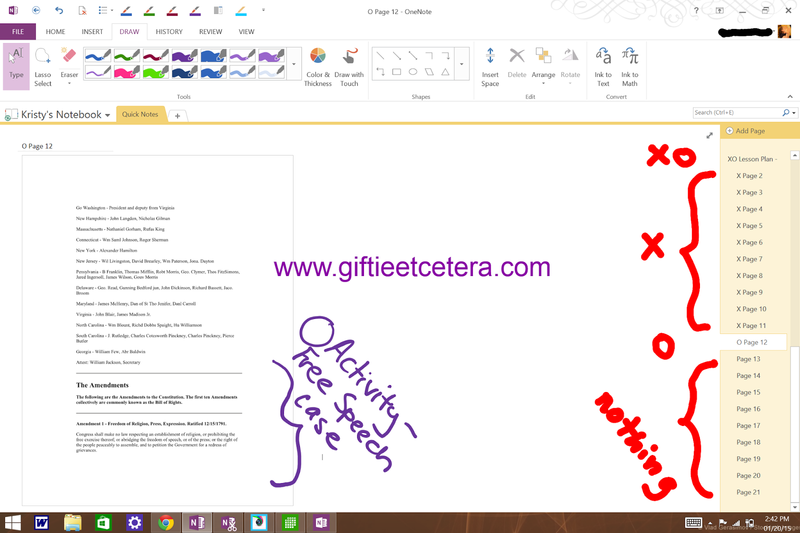 I use OneNote alot to keep track of things. I may need to start this though, it looks super organized! I like a simple plan that is easy to keep up with. For what it's worth-jeannie. This is so over my head, but totally something I need to do... I'm terrible at keeping track of things and editing... thanks for the info! This is an awesome system! Even if you were to use it for actual paper, just use those symbols in the top corner of each page, and it would be super simple to see what still needs to be done or is completed! What a great idea! I struggle with this for printed papers. I really need to get a handle on those too. This is a great system! Thanks for sharing. I may have to start using something similar. I had no idea how to do this. Thanks!